Welcome to my corner of the weekly romance writers round robin. Thanks to Jo Richardson, author of Cursed Be the Wicked, for the hand-off. This week’s questions come from Julie Abdinoor, who shares my fondness for Michael Fassbender. I write contemporaries and my main characters are from their mid-twenties to mid thirties. Marine biologist Arabella in my WIP Stolen Heart is 29 and ex-Marine Gus is 33. So, old enough to have had their hearts broken at least once, launched careers or finished school and to have racked up a life event or two. I’d love to see romances with older characters (forties, fifties) because they carry an even richer layer of experience. Plus there’s the whole boomer thing. I may write some myself in the future. 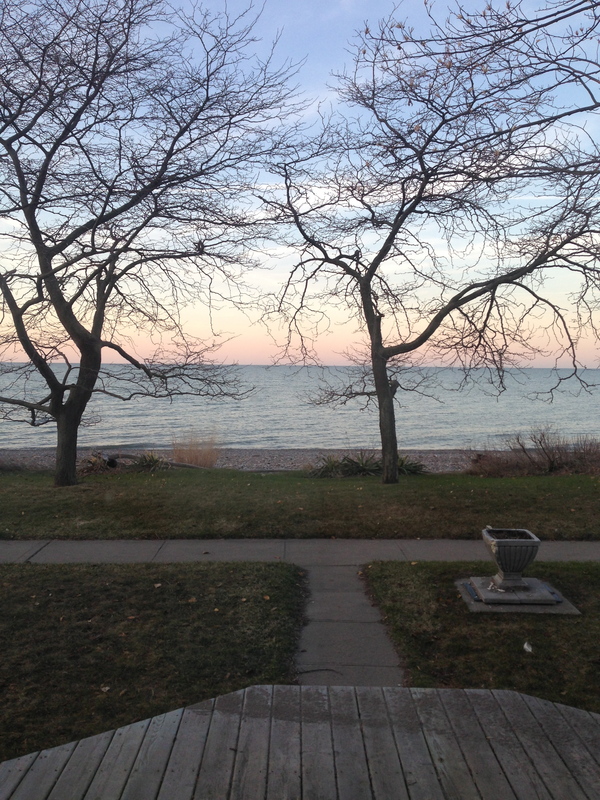 I grew up on Lake Erie with this view out my window. Beaches, lake views, anyplace with water, sky and trees do it for me. I’m always very inspired on vacation. Give me a day or two to relax, and I’m cooking up new characters and plot points. Live life to the fullest. Trust yourself. Nothing is set in stone and the rule book is always being re-written. Explore, dance, sing, live, love, laugh. We only get one go-around. Carpe diem! I’m a water girl too! Boy, it was hard to read past those abs! I agree, live life to the fullest! Great message! Love your cover! And I could really use a vacation. Maybe some writing time in Trafalgar Square. Yes, live life to the fullest! I’ve started eliminating things from my life that keep me from doing what I really want to do. It’s amazing how freeing it is. Thank you so much, Kim, for the wonderful introduction 🙂 I am starting to think a few of us should put together an anthology for older heroes and heroines 🙂 Great answers!!! Great inspiration. Live life to the fullest is the best message of all. I loved your answers!